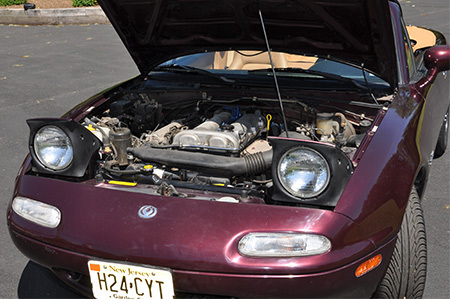 Congratulations to Peter on the selection of his 1995 M as the July Miata of the Month! Like many stories, this is both bitter and sweet. I will start with the bitter and end with the sweet, since this is definitely the way most of us want to hear a story. In 1995 my dad broke the news that the car was no longer worth fixing. I remember arguing with him to let me take it and restore it, but he insisted that it would be a drain on me and my new wife. He sold it to a man for $2500! No rust, no damage on the body and a good engine for $2500. I still cringe when I think of it, but such was his wisdom and my folly. 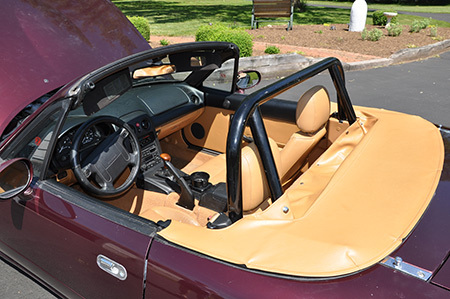 He went to different dealers in the Triangle area of NC looking for a suitable replacement for his venerable 911 and when he got to the Mazda dealer they were off-loading a brand new 1995 M edition Miata. He had read about it in Road & Track, and after a test drive, he bought it right on the spot. As skeptical as I was, I have to say that the Miata has topped the 911. No, it wasn’t as austere and Germanic. No, the Miata wasn’t as fast (almost), and no, it did not have the air of sophistication that the 911 had, but it is definitely a better car. A case in point is the flexibility. The Miata is unequivocally more robust and forgiving than the 911 ever was. 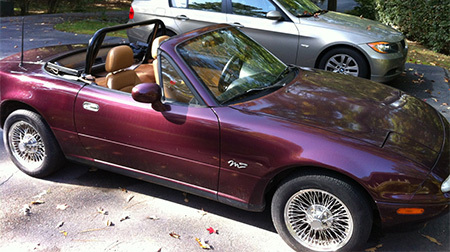 I recall lugging the 911 and finding it to balk and complain to no end but the Miata never has. The 911 insisted that you knew how to drive it. The Miata, not so much so. Those purists will insist that the 911 rewards those who know how to drive, and I will not argue with that, but driving a 911 in the ice and snow is something that should be reserved for those with 9 lives, because you could easily use 8 of them just getting to grandma’s for Christmas! My dad was very good at driving and he taught through example. That 911 was a kitten in his hands and I have always tried to emulate his skill, and yes, he drove it through ice and snow on a regular basis and never had a problem! He would shift easily and relaxed, and the cars he drove appreciated it. Anyway, I digress. 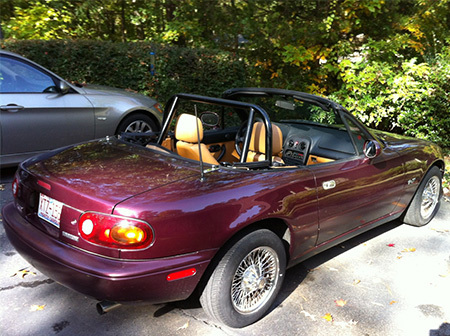 The Miata became his new passion and he was always talking about the sheer pleasure of driving it. He let me drive it whenever we visited and I found it to be rather slow, but totally enjoyable. So, fast forward to 2012 and we find that my dad is 85 years old, and with severe back problems. 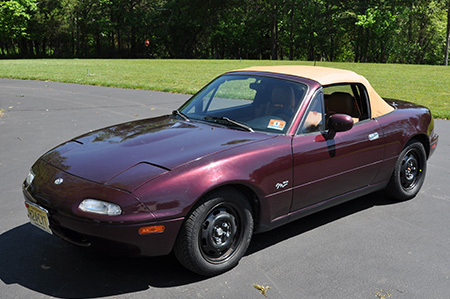 On a visit last October he told me that if I wanted the Miata, I could have it, ostensibly for Andrew my 16 year old son who was just learning to drive. In April 2013, he handed me the keys, and all his records along with a clean title that was notorized with my name as the benefactor. Thus ends the bitter side, since to see my dad give up his car, is the saddest I have seen him. I wanted to cry. The next day I threw my suitcase in the passenger side seat (it would not fit in the trunk) and drove away from Chapel Hill and headed north to New Jersey. With respect to his wishes and concerns, I kept to minor roads, and took old route 15 all the way to Gettysburg on the first day. I had the top down for at least half of it, but rain came in the afternoon, and as I drove north, the temperature dropped. The car was wonderful, but it was not without fault. The 17 year old suspension was noisy and over about 50 mph the car would shake, so I knew the wisdom of his wishes and just took my time. After sleeping outside of Gettysburg, I headed straight to a shop just north of Allentown, PA, that specializes in wheel/alignment issues. They determined that the wheel rims were shot, and that I needed to have them repaired. My dad had purchased Dayton wire rims at a considerable expense several years back and they were the worse for wear. I agreed to ship them to Dayton for repair and the shop sent me on my way with a set of standard steel rims to get me home. What a difference! The car handled much better, but the suspension had seen better days. Since April, my son and I have had the vinyl top replaced professionally, and upgraded the suspension to lower springs and Tokico Illumina shocks along with beefer sway bars at both ends. The car is vastly improved and feels solid on the highway at 75 mph. The steering is still a little vague, so we are going to replace the tie rod ends soon. In all, the car is simply wonderful, and I find myself choosing it whenever I can. I am more inclined to drive it than my Audi A5! The reason is that I can really enjoy the twisties without driving at dangerously illegal speeds! The rear wheel drive and the Torsen limited slip make the car so thrilling.